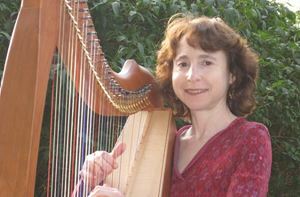 Sabrina Sigal Falls is a professional harpist who plays harp music for weddings, special events and funerals throughout the Indianapolis and central Indiana area. She is a Certified Music Practitioner (CMP), having completed the Music for Healing and Transition Program, a National Educational Certification Program for musicians who wish to become music practitioners. As a CMP, Sabrina frequently plays live therapeutic harp music at the bedside in hospitals, hospices, or homes. Please click on the Facebook icon below to see Sabrina playing at various events or contact Sabrina about playing for your event!